Betsoft Gaming have created a sequel to their lavishly-themed 'The Glam Life' with the equally luxurious Mega Glam Life. Yes, this isn't just a glam life, this is glam taken to the mega level. This is bling with bells on! 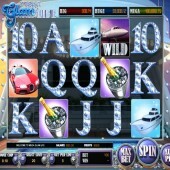 Mega Glam Life is a 5 reel, 20 payline slot that takes you to the world where the 1% lives and splashes the cash. We've all seen this theme on a countless number of occasions across the slots platform but is this a slot that offers something different? The symbols are all related to the kind of lifestyle us mere mortals can only dream of. There are multi-million dollar yachts, flash cars, diamond encrusted watches, bottles of champagne on ice, and even the regular 10-through-to-Ace symbols are decorated in jewels. The Wild symbol is represented by a private jet. It substitutes for all other symbols across the reels, except for the Scatters and Bonus symbols, to complete any potential winning combinations that might pop up. These Wilds also wield a bit more power than your average Wilds. If you hit three or more Wilds on the reels then you will trigger the Wild Re-Spin Bonus. All of the Wilds will remain in place for one re-spin allowing you the chance to hit some more winning combinations. The re-spin cannot be re-triggered. Free spins are also available to trigger on this slot. 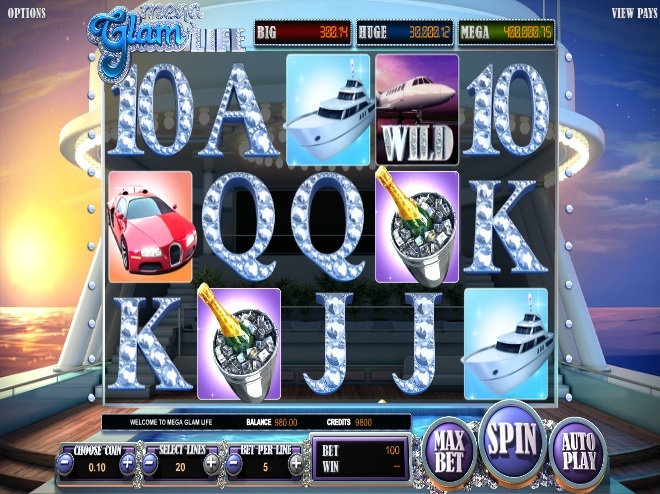 You will need to hit three or more island paradise Scatters on the reels to trigger up to 16 free spins. A multiplier value of 3x is also added to any wins achieved during the free spins. It is possible to re-trigger the free spins by hitting three or more Scatters across the reels during the free spins. Further multipliers and 3 extra free spins can also be added if you hit one or two Scatters on the reels during the free spins. Will You Win the Mega Glam Life Progressive Jackpot? This slot even goes the extra mile and has a progressive jackpot included which was not something that was a part of its predecessor. You will need to hit three Bonus symbols on reels 3, 4, and 5 in order to spin the three-tiered Money Wheel and stand a chance of winning the jackpot. I'm sure we can all agree that it is always a good thing to see a progressive jackpot on a slots title. Mega Glam Life could well be a slot that pushes Betsoft Gaming back to the forefront of slots development after a period in the shadows. If you want to get players to stand up and take notice then a progressive jackpot is a great way of doing so. It has some way to go before it can hit the same peaks as the record-breaking Mega Fortune slot from those clever minds at NetEnt but this is a slot that could well deliver some big winners in the coming months and years so it is worth keeping it on your shortlist of games to play.